The idea of ‘process over product’ is thrown around a lot regarding kids and creative processes. Still social media platforms like Pinterest and Facebook pages are littered with craft ideas for kids and crafts are so dang popular that I’m scared to write this post. You see, I want to provide a different point of view on this focus. Let’s reflect together and share authentic ideas of what is meaningful, respectful and helpful for children. What is the real point of a predetermined result and expectations with respect to art and creativity? How does this help the creative process and children’s unique abilities and inspiration? Before I hear the debate that it’s good for kids to follow orders – I want you to think of all the ways that kids already have instruction in their lives. In my opinion, there are many more appropriate ways to obtain this kind of instruction where it’s free from pressure and expectations and removed from creativity and arts. Think of all the recipes, board game rules, science experiments, Lego instructions, sports rules – just to name a few! I feel that each of these examples has a clear helpful and meaningful result. Can you say the same for a crafts? Cookie cutter crafts, in my opinion, are limiting and riddled with expectation that really removes the creativity from art. The creative process for anyone – children included – should be the opposite of limiting. For those who say it’s ‘just a bit of fun’– for whom and in which way? If a child really does love to make cookie-cutter crafts then of course – that’s up to them. But it’s potentially harmful when it’s pressured or expected. Creativity and arts is fun enough without predetermined results and expectations. Some children will make typical ‘crafts’ with art materials on their own accord in a way that is truly significant to them. Crafts can provide inspiration – sure – but in the same way that famous artists can. I don’t believe it should be a matter of force. Open-ended creative design for all ages is so much more fulfilling and, well, creative! 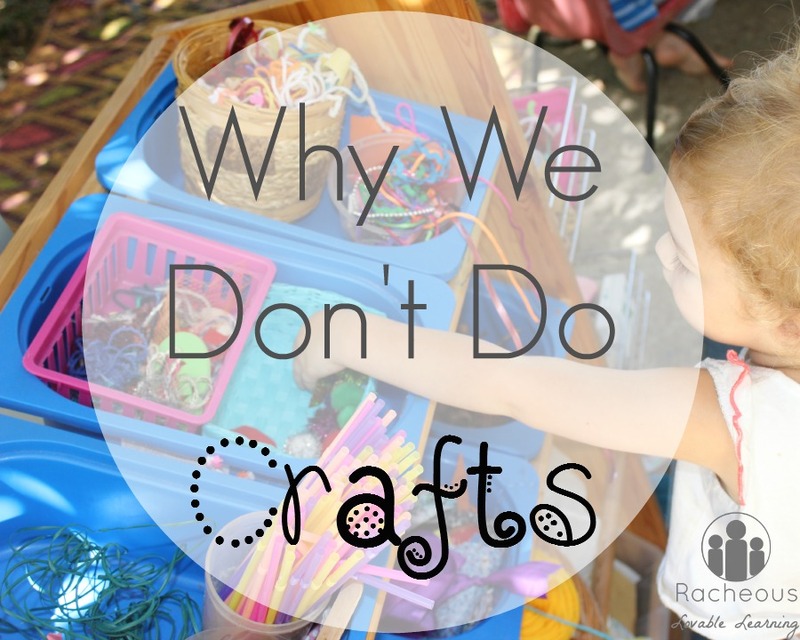 ETA: Unfortunately I couldn’t title this “Why we don’t do crafts that are not purposeful or meaningful to the child and impose unnecessary expectations on them” but that’s the basic premise. Craft materials are still all throughout our home and life but we are yet to do any crafts (i.e. craft kits or crafts with a specific outcome). However, I can see how ‘crafts’ can also include knitting/sewing/felting/etc and that certainly can benefit from instruction to help learn the technique needed. What do you think? This is just my opinion after all! Absolutely agree! Process art is where it’s at people. Yes – you can’t go past freedom to explore and creatively experiment with art and craft materials for kids! I agree in principle, we shouldn’t force children to produce a certain object through craft where they don’t want to and we shouldn’t criticise if they choose to create in a different way. But, your list is flawed. How is it fundamentally any different than Lego? Or a recipe? These things can also be approached creatively and they will produce a particular outcome or not. If a child wants to make a Lego model that looks like the one on the box they have to follow the instructions, just like if they want to produce a craft that looks like the example. If they want to see what they can make with the same materials then they can, with both Lego and a craft. And if they want to take an idea or a skill from the craft or the Lego and then adapt it to their own idea, they can do that too. We do crafts in our house occasionally, and my kids enjoy having a go and seeing if they can produce something like the example, but we also have an element of creativity in there and we never stress an importance in doing it ‘right’. We sometimes have a chat about why ours didn’t turn out quite the same, too. Mostly I mean that it’s about intention and limiting creativity to produce an outcome that isn’t meaningful for the child. Just as I wouldn’t introduce Lego with a kit straight off the bat and would prefer open-ended exploration and experimentation – I feel the same for art and craft materials and creativity. We still use craft materials but in an open-ended way. If my kids see something they like and want to try then by all means but to me it’s about reducing the restrictiveness. 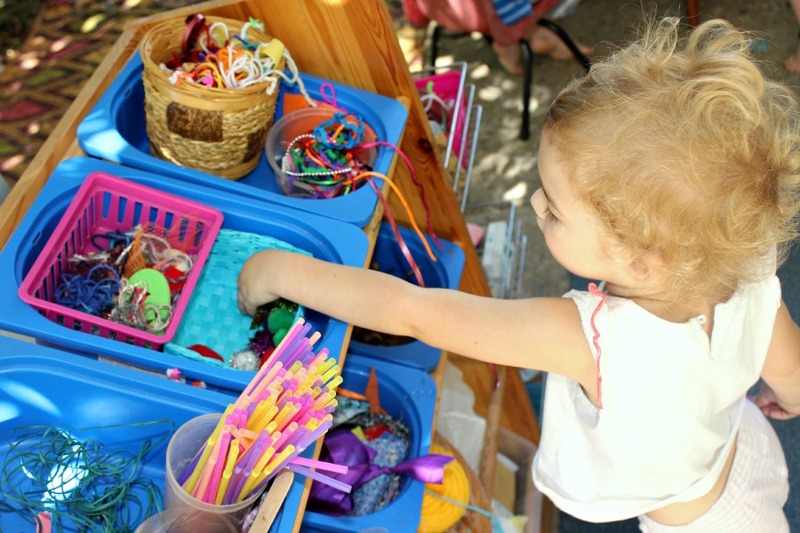 There are some crafts that really work well with some instruction when it’s meaningful to the child – like sewing or building a birdhouse for example. My issue like I said is with cookie-cutter cutesie crafts that lack purpose or meaning for the child and are imposed by an adult. I think both kinds of crafting can have a place. It doesn’t have to be all one way or the other. Not all aspects of life have to be about not following rules, or pushing boundaries, or challenging the norm. My kids do both kinds of crafting and enjoy both. Because they are fun – fun for them, fun for me. They get to explore different materials in different ways.And even with a tutorial or end product in mind creativity comes into play. My kids are young and enjoying life. They express themselves creatively all the time and do not feel confined and defined. I’m all about challenging and questioning the norm so you’ve got me there. As I said in the post for me it’s about intent and whether it’s meaningful for the child. Like you said it is in your case and that’s great. No one is saying kids that enjoy crafts with a pre-determined outcome are not young and enjoying life. I am speaking of those who don’t have the choice or variety to freely explore creatively which doesn’t apply to you. Never had really thought about it but now absolutely agree 100%!!! I love these kinds of comments – my absolute fave. Thanks Claudia for reading and commenting! I think balance is the key, as with so many other things in life. However I absolutely agree that cookie cutter crafts ‘pushed or forced’ on kids is not the way to go. My son is a draw and do his own thing, but my daughter loves crafts just as much as all of the freedom she is given with her art and the supplies. Find what your kids love and go with that and you really can’t go wrong! I agree with the “idea” behind this post, but I do not belive in anyway it is a waste of time to incorporate. I think the two important outcomes they get from crafting is time spent with mommy and the pride they get in themselves after seeing the end result. Sure there is some instruction involved but it doesn’t have to be completely step by step. I believe there is still room for creativity. But if it’s one thing I never get tired of hearing is, “Mommy, look what I made for you!” Once they get the handle on making crafts with you, then it allows them the confidence to create on their own. Nothing says art has to be restricted to a white piece of paper. For me personally I find that the kids I know and my own kids gain that pride and ability from exploring materials freely through process art so have the same result without the imposed expectations or outcome. I totally agree. I never did craft when I was a kid. I was in kindergarten from the age of two. I also do not see the point to do with with my child. Art and creative experiments are more meaningful to me. I was a rewards-oriented child due to my authoritarian upbringing so liked crafts because I was a perfectionist and liked getting things ‘right’ but I don’t think that’s a good thing. Yes! Totally agree. I find doing crafts with a pre-determined outcome with my son is just frustrating for both of us. Much more fun and rewarding to provide some materials and see where he goes with it! It’s fascinating to watch. The same with Lego etc -we both learn so much more (and from each other) when we make our own designs rather than trying to recreate the picture on the box. Maybe it would be different with older children if they wanted to create something specific and follow the instructions? But again, the learning process is far greater as is the satisfaction if they have to figure it out for themselves. I so agree, same here. I agree that once they’re older and it’s meaningful or purposeful to them that sometimes results-based crafts can be exciting for some. Yep I find childcare centres and schools the worst offenders because many parents are expecting results driven pieces to take home. It really concerns me. I think the purpose of structured crafts should be to introduce new materials and processes. It is nice to have a variety of craft materials but it is even nicer when you have been instructed on the various ways that you can employ them. Creativity and freedom expression is awesome but having a base of knowledge as a foundation is also important. Completely agree! Specific crafts provide materials and instruction in their use. Once kids know how materials work they can really create! We craft a lot here in both ways,and my kids enjoy both. They are also not forced to make something if they don’t want to, but usually I have the opposite problem of them wanting to make more then I have supplies for! See I believe that when introducing new materials the last thing you want is instruction and forcing expectation. I believe process art and exploring and experimenting with the resources and their creativity is far more beneficial particularly at that stage. I think for some craft (say knitting for example) that of course instruction comes into play. But what I’m discussing is purposeless cookie cutter crafts that are meaningless to the child. Great piece! We don’t do crafts either. Don’t get me wrong, I would love to weave me some rubber band bracelets with the kids, but they have no interest. Instead, we have free access to craft materials and they create whatever moves them, from a giant ball of tape to a three-legged monster. None of it looks like what’s on the craft box at the store, but it makes them happy and gives expression to their imagination. Isn’t that what art is all about? I do agree with a lot of what you say, however, I also wanted to add that, if your kids go to an elementary school with Art class, there will inevitably be predetermined results and expectations that are part of the curriculum. So, perhaps it isn’t the worst thing to start it young since this is something they will need to get used to in school anyway. Well since we do and will homeschool thankfully that won’t be an issue and I’m definitely not of the opinion of starting early and stifling creativity (in my opinion of course) as a result. I completely disagree with this. Just because children will later be subject to stupidity does not mean we should begin training them to deal with it from an early age. Frankly the later one is exposed the better. I love posts like this! Not extremely popular but so true! If we could somehow get teachers, parents and society as a whole to understand coloring sheets and “crafts” are limiting allowing children to fail! Thank you so much for your post! Look forward to many more! Thanks so much for reading and commenting Christina! I so agree and hate colouring competitions and the like for the same reason. When I see classrooms full of identical craft I’m really turned off. The children even have trouble identifying which one is the one that they have made.. Same here, I so agree! True creativity comes from new ideas and making ‘mistakes’. I agree if you expect a child to make a craft like a picture on a package or Pinterest it does not allow creativity, but often we use that picture as a starting point. I never tell my daughter that she has to do something one way or another. In fact we usually look at the picture and then change it how we feel. Doing crafts can be very creative if you do them in a non-perfect way. I never expect her crafts to be perfect or for her to follow the instructions all the way. If she wants to follow them I help her if she needs it, but we don’t force it. She is always happy with how her crafts come out even when they do not look like the expected pictures and often she likes hers more. I didn’t read through all of the comments, but while I think it’s important to encourage creativity and artistic expression by allowing children the freedom to whatever they want with art supplies I still think there’s a place for more traditional crafts. As a former kindergarten teacher I often used crafts (because they’re fun!) to teach another concept or skill. For example, we would practice patterns by stringing colored pasta on yarn. We practiced shapes and colors through a scarecrow craft. We learned about geometry by making shapes with straws or Popsicle sticks. There are so many concepts you can teach and practice through arts and crafts. 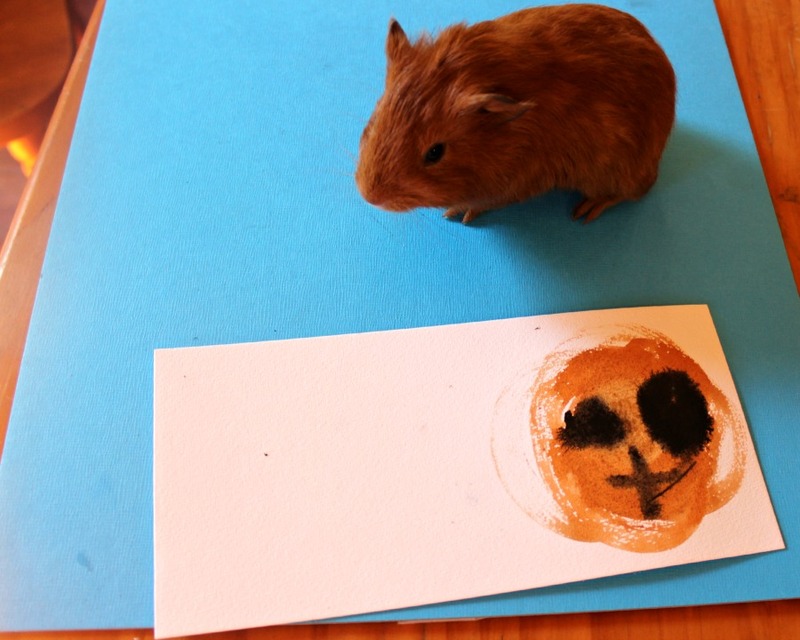 So, yes it’s definitely important to give kids a chance to go wild with the art supplies. Yet, when I look through pinterest and see all of the cookie cutter art projects, I’m just looking at all of the other skills to teach through those projects. I have a 7 year old with SPD. He’s a perfectionist with poor fine motor skills. I have a 3 year old that WANs to do EVERYTHING herself. Arts and crafts in our house would be pure torture. A piece of paper and crayon is good for me. Great write up! Thanks for being brave enough to share your thoughts! My 4-year-old has NEVER completed a craft in the way it was intended to be done. I do provide him access to craft items on a regular basis and I may sometimes will sit with him and complete a project as it would be intended. As of yet, he has never chosen to follow my lead or copy the craft. I am totally fine with that and have never pushed him to do what I’m doing or what others are doing. I am proud of his amazing imagination and ability to create his own projects with basically anything. Being a Pre-K 4 teacher, I think there is a place for crafts, especially if parents are doing them with their children. Crafts can provide a foundational base for learning how to use art tools and materials. Once kids have these skills, then they can move on to designing their own pieces. 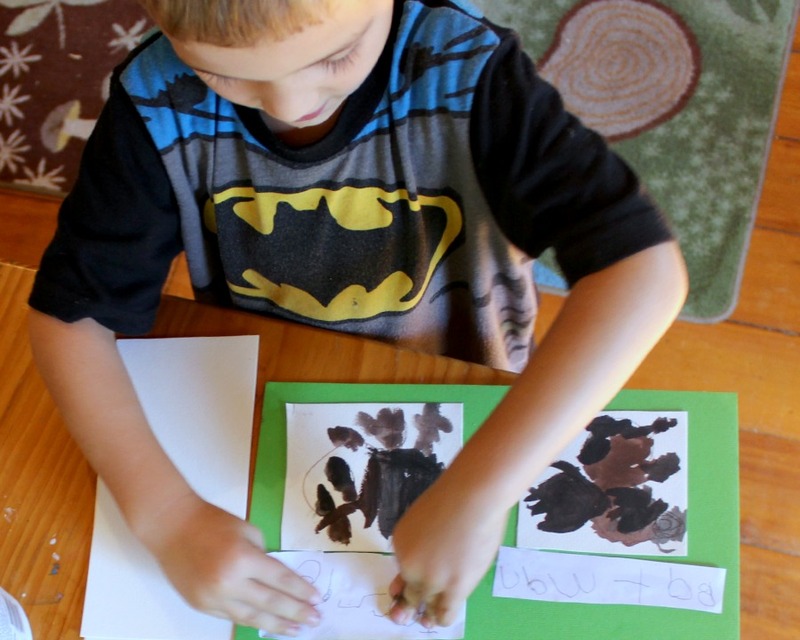 If my 4-year old students did crafts at home, then they could enter pre-k already having a foundational skill base for using materials, and we could begin the year doing open-ended, project-based pieces where the students are in charge of the design. Since my students don’t do art at home, I do some crafts in the beginning of the year to give them this foundation. This works until you need a particular process to achieve a desired outcome. That outcome is ofc up to the child to seek, but once an elder, youtube or book is found there are plenty of crafts that are not simply reinventing the wheel with random materials. They can require years of specific skills honing to attain mastery. This is why you don’t see 2 year olds work in every gallery. Everything from digital animation to fiber art comes from a base in crafts coupled with learning from other sources to attain mastery. It is tweeked along the way to the individuals particular taste as they gain more and varied skills. Take crochet for example. One can learn any which way they choose but chain stitch will always be a base of that craft. Without it the rest is unattainable. Clay work and joining is another example. My 8 year old daughter follows tutorials on youtube learning to draw realistic pictures, her creativity is absolutly not hampered, she is encouraged to push past frustration and rise to the challenge, and she is rewarded with a fantastic skill for her efforts well as plenty of ideas to make it her own. Combining materials in new ways is also a very important part of creativity but without the know how to use the materials, it’s like asking someone to write poetry when they have never used a pencil or paper. Crafts help do this and provided everyone is having fun I really don’t see any issue with free creative play or any truly desired craft activity. They both have purpose. I am so not disciplined for “crafts”. In my house we do art how I learned to do art with what you´ve got and whatever comes out. Usually its a mess and I have to try and not stress but it´s what they enjoy. I´ll let the preschool do the “follow the rules” kind of art. I liked your story and the photo of the hamster! As an Educator in a family day care I agree, open ended craft is fantastic. I like plopping down a few toys or something natural or subject based (farm animals, dinosaurs) as inspiration, then listening as the kids tell stories about what they’re drawing. However, don’t lose sight of the non creative things that a child is learning when they follow directions in art and other activities. Yes, capturing and holding their interest is pivotal in a successful activity. But when I teach children, I teach them with a view to what a lot of children are missing these days – attention span, ability to listen to instructions, manners, the ability to sit down for a while even if they don’t want to. To teach them and enable them to gain those abilities is to give them an edge when others wouldn’t. Eg. The rude old man the other day at the shop, harping on about having to wait in line, vs. the nice lady who asked politely for another checkout to be opened, then politely pointed out she’d been waiting for a while. She got what she wanted, where he was told to wait. Back to Craft and Creativity, It is ironic that, with the abundance of toys and craft that preschoolers have access to, studies have shown that academic abilities in the early years have gone up, whereas imagination and creativity have taken a blow, dropping drastically. Craft and anything you do in life is limited and riddled with expectations if you yourself limit it or have expectations. Its not the activity that is limiting but those who set the limits and expectations. I can dig this post.. I am all about crafts or more so the idea of them. I would like us to do more crafts (before this post) but always feel pressured myself in the materials needed and instructions and rigidness. After reading this post it seems as though we should just hand kids some materials and let them create whatever they want.. as simple as that is, I’ve never thought of it..
i agree I look up kids crafts to basically get ideas for what types of materials to use then i put them all on the table and let my child go for it. I don’t give instructions I just let her create shes only 2 getting used to gluing and cutting and being creative in her own way is more important than the finished product. I like the crafts where you make toys or musical instruments because then she has a product that she helped with and can play with, she loves that. Thank you!! This is just the sort of reminder I need. I understand the importance of the process and I’ve seen my daughter create such unique things from things just lying around and she is only 5 but I still tend to get carried away when I see something online and then without realizing, I suggest that she should try it my way instead of doing it her way and that is so damaging to her creativity. So…thanks again. Your views are interesting, but not unique. They are however one sided and not balanced. You are leaning towards the view that art with an outcome done with a bunch of children leaves no room for creativity. That in itself is a narrow minded view. That concept relies with the teacher or educator in charge not allowing any variation, or child input into the creative process, which you implied and is an insult to so many educators, tarring them all with the same brush. Things work differently in a home school environment. You have more time and less children. While I can see your point, you are obviously unaware that most of the art created by children in this environment in non structured and free choice. I know this because I work in both Ldc and FDC environments. I also know the value of a balanced structured craft which doesn’t make children feel like a failure, because we teach that all art is unique and beautiful like them but it does teach skills like concentration, persistence, problem solving, patterning, shape, line, colour and through instruction point these out to children so they know the words and meaning to their discoveries that they can transfer and adapt to their open ened free choice art. If you want to talk about setting kids up for failure, it is when a child only has access to a one sided view with no balance and then reaches traditional schooling. They then struggle to understand instruction, time constraints, why they have to write in a book instead of on blue paper because that’s what they want to do. There is value in what you say for someone who ONLY does strict processed craft, but in my extensive experience in the field of childcare/kindy it is not true. Balance is the key to anyone, children and adults alike. I totally see this side of the picture, and agree on many levels. When I give my kids crafts to do it is always something that we have made ourselves, completely from scratch. They have a lot of ‘creative license’ with them, and often prefer to go their own way and make something different which is fine with me. Kids have an amazing amount of creativity and it’s really beautiful to see. I will say that there CAN be a balance, and that you can give a kid a direction to go in, rather than a set-in-stone finished product and they are still developing creativity from that. Learning new techniques is valuable for their own creativity too. Just to add another thought. When you hand a two year old a crayon and a blank piece of paper and they start to scribble, you may think that it is “useless”. When in fact it is the beginning of prewriting skills. They may start to have a death grip on the crayon, but eventually will move the crayon from the palmer grip to a pincer grip. Those random circles, lines will turn into letters and such. Arts and crafts is never about the “end result” it is always the process. Picking up bits of paper (pincer grasp) and placing it on the glue is a fine motor challenge. Same with using scissors, children need to practice cutting different materials (how many adults can go through an average day without using scissors? lol). Also arts and crafts help children fine tune hand and eye co-ordination (even though there are lots of ways to achieve that as well). In my toddler room even though I gave them the same pieces to glue, the end results were always different because I never told them to put the eye here or there. I just gave them the pieces and they did as they pleased. The point of craft kits is that they offer a very basic learning experience. With crafting, as with everything, there is a learning curve. If you don’t learn how things work, you don’t have a platform from which to jump in your own direction. Sure, you could just let the kids start randomly putting things together with no instruction, but they’re going to have a lot less frustration if they at least learn basic skills first. It’s true that the artists (and mathematicians, and engineers, and scientists, and…) who make the biggest contributions to the world are the ones who “break the rules” in a meaningful way. Before you can do that, though, you have to know what the “rules” are, and why. I love reading everyone’s opinions about this! 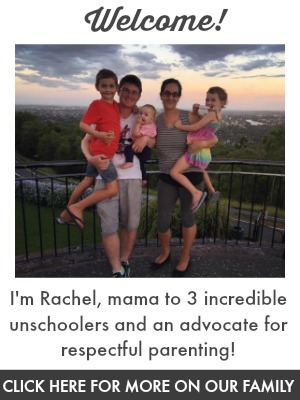 Thanks, Rachel, for sparking the conversation. It is one that I have thought about a lot ever since I began teaching preschool and children’s art classes years ago. I absolutely agree with you when it comes to young kids- from toddlers up to age 5 or so. Ideally, kids should be given the freedom to explore art materials in their own way through out these early years (in response to some of the other comments, kids can still be challenged and learn new skills without instructional crafts). Then as they get older, they will feel confident in their creativity and will be ready to try out instructional crafts. This way they will already have a strong creative foundation to build upon. I’m glad you shared this viewpoint, though, I think it’s important to talk about. There’s no right way. There’s no wrong way. There is only YOUR way. I love to hear the children say it, especially to new visitors to our class. I like both ways for my art time with the kids. All the reasons for open ended art is spot on and totally valid. I do like, with my older one at least, to do some things with an outcome. He takes pride in making ornaments each year for us and our family. That’s just one example of where a specific “craft” could come in handy. Also, it’s fun to see his interpretation of the craft. As an adult, if I go to a painting night with friends for example, We all paint the same concept and are instructed by the same person but all of our peices are different and unique. I personally loved crafting as a child and still do. Just like in cooking, if you learn a technique (by following instructions) you can play around with ingredients; if you learn a crafting technique you can create so many more things. I used to make key chains as a child and gave them as gifts. They were silly little things that I made with great pride and gave me satisfaction. My point is, both ways have a place. I do however think there is more of an emphasis placed on “crafting” so it’s good to read things like this to keep us parents thinking about other ways to enrich our children with creative opportunities. It’s like I read my mind… I have been feeling the same way about this but could not speak loud ;) We do crafts but we always try to get a purpose to it: most times it’s something to play with that kids came up with. And yes we did try to follow a cookie cutter craft and I saw how unmotivated my kids were. They already knew how will this turn out. I didn’t see a purpose in it when the child has to replicate something that has been already done. “Crafts” aren’t just about following directions or having rules. They are very much what “hands on” learners need. Worksheets, books, games, and other things often don’t work for these types of learners. What they need is something that they can put their hands on and learn from. I think no matter what the craft type is, they are essential for kids to learn, explore, and grow. I think you can be creative with a “purpose”, too. Yes, giving kids a pile of materials and letting them go can be creative, but it can also be a major waste of materials/money. Their goal is to put as much stuff onto a sheet of paper as possible. Sometimes crafts allows kids to see that they make something by being selective instead of all inclusive. Many times the “creative” art projects of a 4/5 year old go right in the trash because a parent can’t keep everything. I don’t get paid much (daycare, not public school) so sometimes I am guarded with the materials I buy. Usually we do a “craft” of some sort and then they are allowed to free play with any left over materials. For every Jackson Pollacks, there is a Mona Lisa. As a note, I direct them but I also don’t freak out of they want to change something as long as there is a reason and they are not just being lazy. In all honesty, it shouldn’t be all or nothing. There is room, and necessity, for both. When I was studying early childhood education back in the 90’s, they used a phrase that I don’t hear much anymore, “open-ended art”. Yet, when I started to look into schools for my kids, all I saw were schools doing close-ended art. That is art like when the teacher cuts out all the construction paper pieces and the kids just glue them on. Often, a parent will be helping at the art center to “guide” the child to glue the pieces on correctly (i.e. it’s a jack o’ lantern, glue the eyes on top and the mouth down below). I believe that a lot of teachers do this to please parents. Parents don’t want their kids coming home with a jack o’ lantern with its eyes where its mouth should be and vice versa. In fact, this open-ended art dilemma played a large part in my decision to homeschool my children. It’s like in teaching school, we were all taught to teach one way, but then teachers end up in a school setting where the ideals were just not doable. Absolutely agree with you. It also suits right brain learning (which is what children are born with initially) that is hands on exploring rather than following rules or copying something already done. Later on or when they are ready or when they find reason to, they will follow rules, stay in between the lines, trust strategies, plan ahead and so on and so forth. That’s how my daughter learned to use the laptop, just as an example. She found it in front of her, played around with it on her own, no one showed her anything and then she/we built on that. Was wondering why we don’t like crafts so much….but she loves making things on her own, exploring and using her imagination, no matter what it says on the box. I’ve often felt this way but wasn’t able to articulate why. I work at a Sudbury school and we have all the usual art supplies and craft materials, which are used constantly, and a big pile of craft kits, which I have rarely seen anyone use and which I would like to get rid of. This post helps me explain to myself why I have a mild revulsion to those kits. Every school I went to as a child was decorated with cookie-cutter crafts where you made, say, a snowman out of three white circles, brown arms, and an orange nose, and then got to make some very limited choices about how to decorate the face and the hat. Gross, and such a poor substitute for actually letting kids, you know, be creative.